Club Penguin Cheats by Mimo777 Club Penguin Cheats by Mimo777: Club Penguin Gaming Puffles Reviewed By You! "Maybe in sled racing black could make no snow for the others, white could make ice for you,orange could eat obstacles, blue could hit opponents with snowballs, red could do stunts, yellow could paint arrows to help, green could save you from falling, pink could dig holes, and purple could dance the snowramps after you. That woul be cool!" With the new Yellow team joining the island this week, Club Penguin wants to know what is the most epic sports moment you have ever had in Club Penguin? I can't wait to hear all those stories! Playing virtual sports can often lead to hilarity, don't ya think? It looks quite cool actually! It does doesn't it? 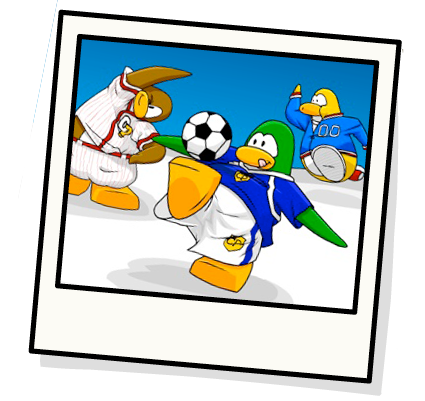 I would use my white puffle to freeze ice paths for me so I can win! ICY the finish line! Yea, they do look kinda like old style Club Penguin feet. Intresting. You referring to the picture or the Reviewed by You comment? Just kidding, I know you're referring to my cocolate milk! that would r o c k!